Follow instructions below to program the remote. 1. Put the key in the ignition turn it to ON (Don't start the engine). 2. Press and hold the valet button/switch for 3 seconds (see figure). Use a pencil or any narrow object to poke through the Programming Button access hole. For most vehicles, the receiver is located under either the driver or passenger front seats. Sometimes it is behind the driver’s dash. In the case of some Camry’s, the receiver can be accessed by gently prying out the black faceplate behind the mirror control switch. 3. The STATUS MONITOR LED (on dash or center console) turns on for 5 seconds. For some vehicles, a double chirp of the horn is heard instead of the flashing light. 4. 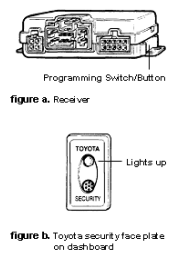 Within 5 seconds of lighting the status MONITOR LED, press and release the transmitter’s TOP or BOTTOM button (either button on your REMOTE CONTROL can be programmed to operate the system - the other button can be programmed to operate a second Toyota vehicle with the same system). 5. Status monitor turns off, chirps one time, and the exterior lights flash one time. In some cases, the only response is a single horn chirp. 6. Go back to step 2 to program more remotes. 7. Turn the ignition OFF and the system will exit programming mode.